We all know that when we insert images, photographs (high-resolution images) in our documents, presentations the result of the size of the file is to be increased. 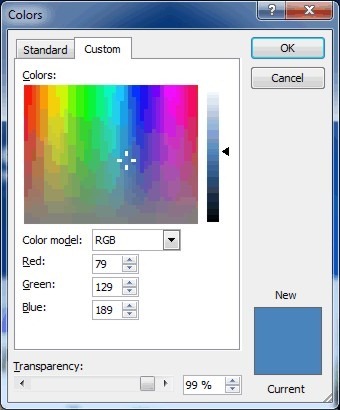 However, we can change the resolution of a picture in order to decrease the image size. 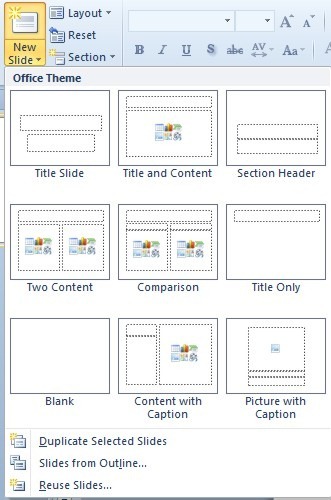 Below I will show how this can be done in PowerPoint. 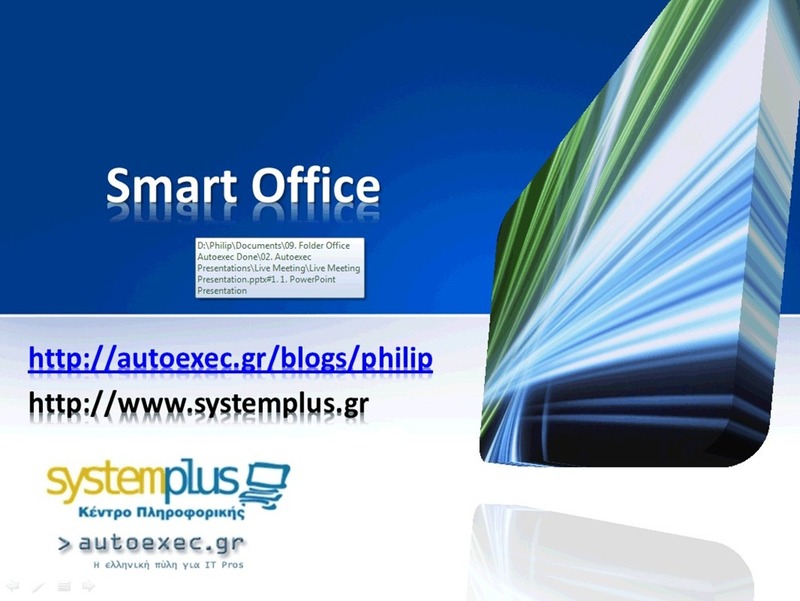 The same procedure stands either if the image is inserted in a Word document or an Excel File. The description of the post has been done with PowerPoint 2010. First we select the picture that we want to change the resolution for by clicking on it with our mouse as shown at the image below. 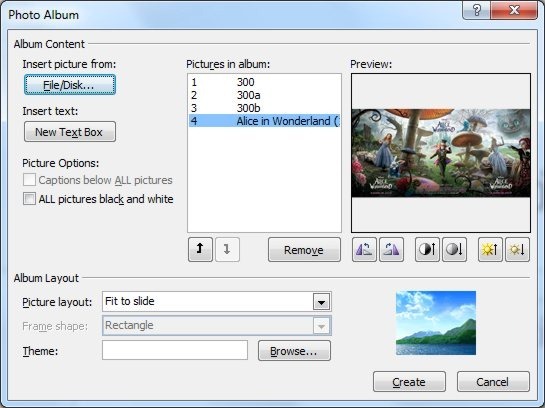 Once the image is selected the Picture Tools is activated, and then on the Format Tab and in the area of the ribbon named Adjust we select the command Compress Pictures as shown below. Once selected the Compress Pictures window appears as we can see. Under the Compression Options area, if we want to change the resolution for the selected picture the command Apply Only To This Picture must be activated. 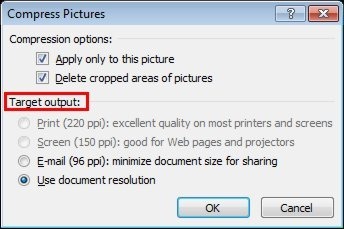 If we want to compress all the photos in the presentation we must uncheck the check box next to the command Apply Only To This Picture. Under the area Target Output, we can click at the resolution that we want and then press the OK button. 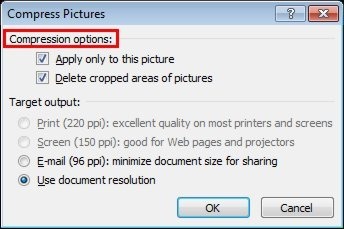 Use Document Resolution: By default, PowerPoint sets the resolution for pictures at 220 dpi. 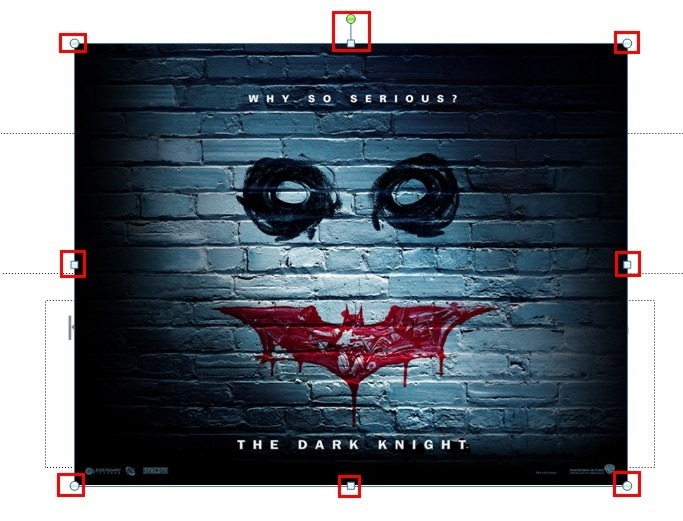 If your inserted photos have a lower resolution, then that resolution would apply. Whatever adjustments we do, we press the OK button to return to our presentation. That is it, the images have been compressed. In the video below and at the end of it, you can view the difference on the size between two files (one with the images not compressed and one with the images compressed). Many times when we click on a image instead of the Picture Tools tab to be activated the Drawing Tools or SmartArt Tools tab appears. 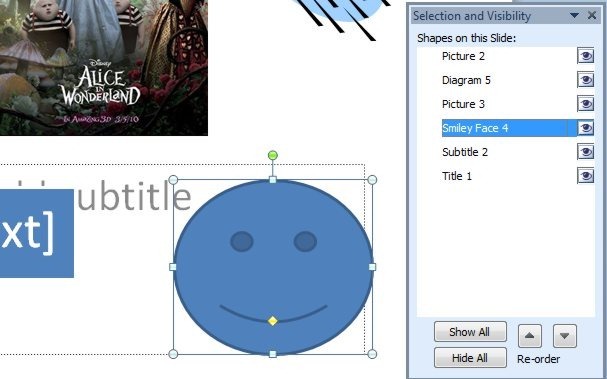 The reason is that the image is not treated as a picture because it is most likely an image with a drawing type of format such as an embedded object as we can see below. 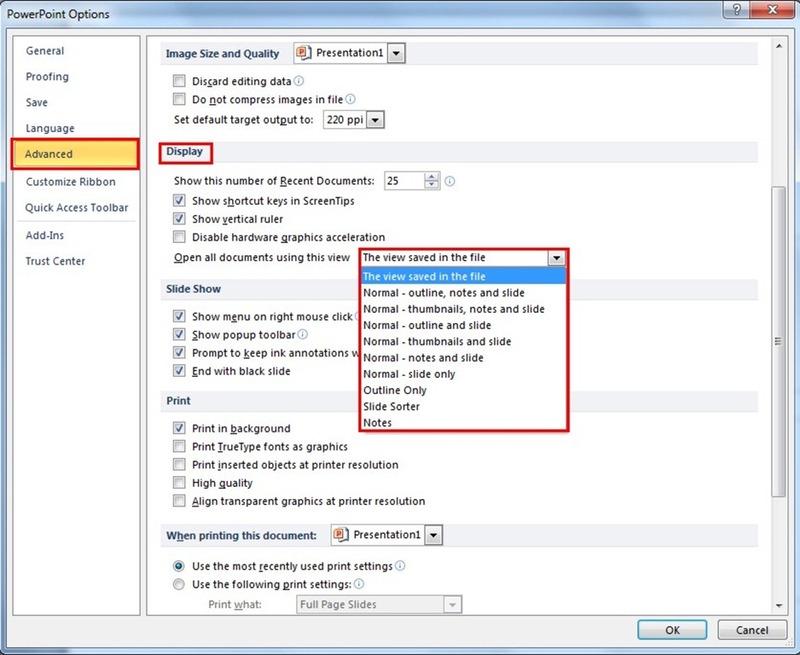 In the video below you can check out the steps on how to change the resolution of a picture in PowerPoint. 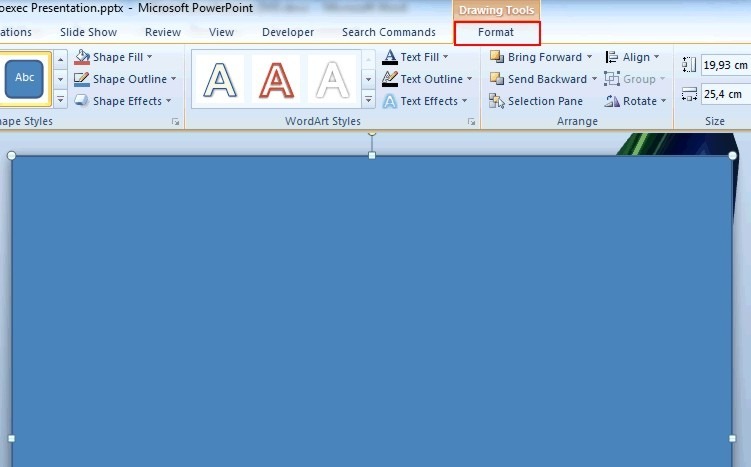 In PowerPoint when we type text into placeholders, the text automatically shrinks in order to fit the placeholder. The AutoFit feature shrinks the text as we type, which has as a result the fonts to be too small to be seen by the audience. A lot of people find that annoying and frustrating. How can we turn of this feature will be described below. 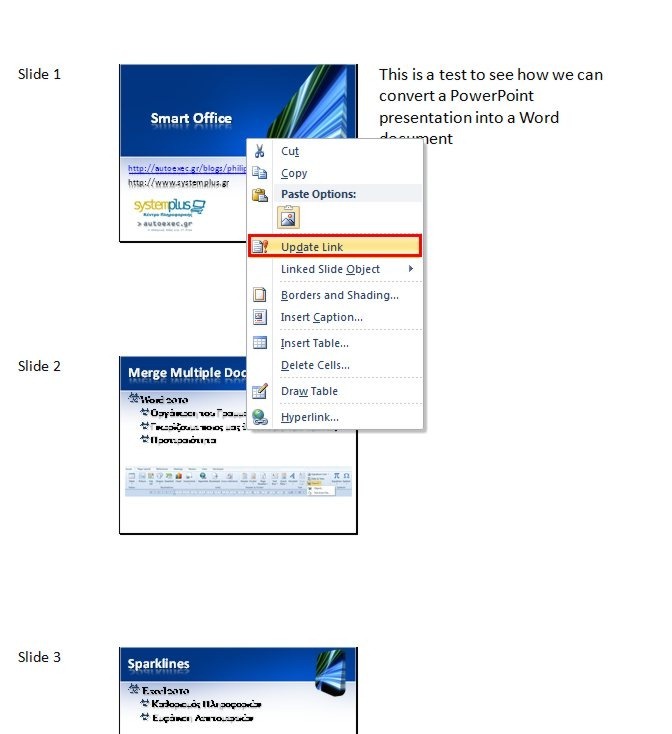 First of all we must select the Office button for PowerPoint 2007 users or the File tab for PowerPoint 2010 users. 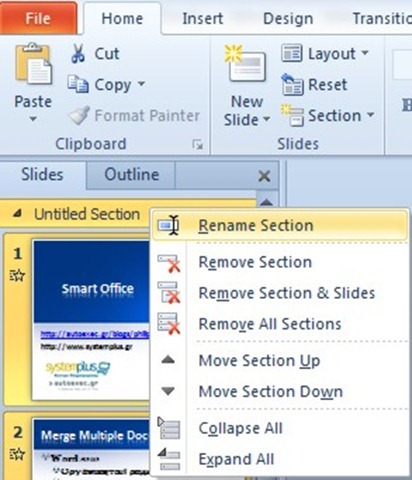 For 2007 users: From the drop down menu we select at the right of the menu PowerPoint Options. For 2010 users. Once in backstage view we select the category Options as we can see in the image below. 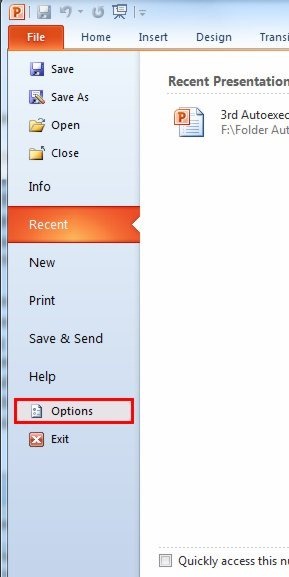 Either version we use, the PowerPoint Options window appears where we select the category Proofing from the left of the window, and then we select the AutoCorrect Options button from the right. 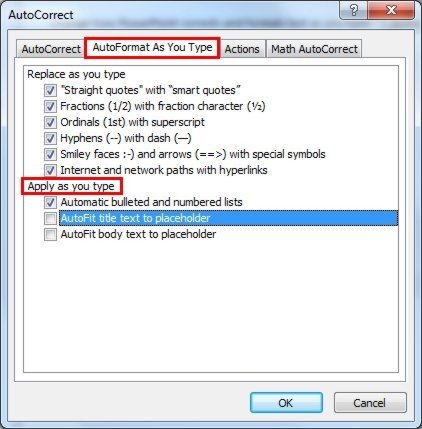 The AutoCorrect window appears, where we must select the tab AutoFormat As You Type as shown in the image below. Then under the area which is named Apply As You Type, we click to clear the check boxes for AutoFit Title Text To Placeholder and AutoFit Body Text To Placeholder, if we want to deactivate both the title and body text from auto sizing. Once deactivated, we press OK to all the open windows in order to return to our presentation. From now on when we type into a placeholder our text will not be shrunk automatically to fit in, but we will have to decrease the font on our own if necessary. 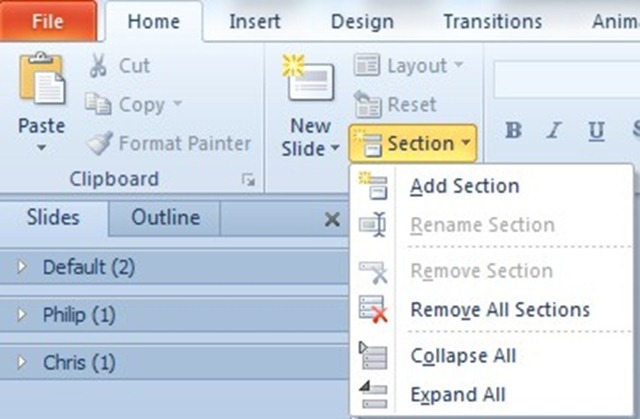 You can also check out the video below describing on how to disable the Auto Resize function in PowerPoint. 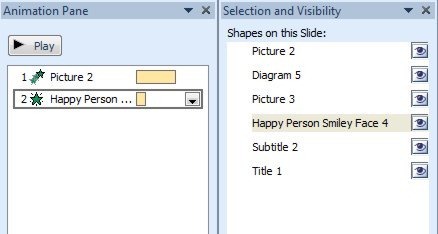 In PowerPoint there is a task pane which is named Selection And Visibility which controls all the components (shapes, objects, placeholders) on a slide. Sometimes when these components are stacked on each other, it is difficult to select each and one of them. To activate the Selection And Visibility task pane, we must select the Home tab and from the area of the ribbon named Editing to select the arrow at the right of the command Selection and from the drop down menu to select the command Selection Pane as shown in the image below. Another way to show the Selection And Visibility task pane is to select an object in our slide. 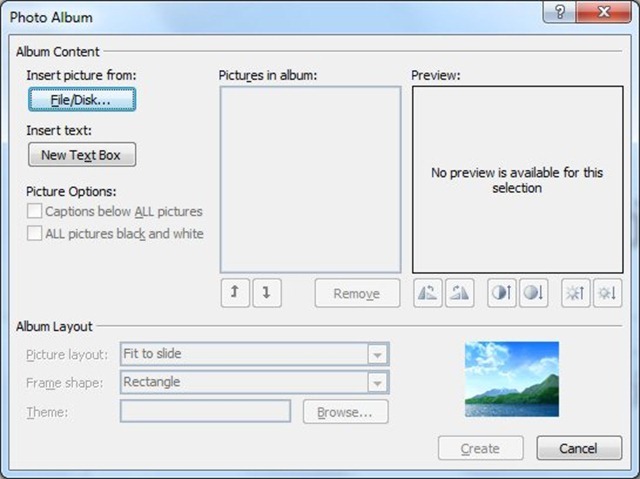 Once selected the Picture Tools tab activates and under the Format tab and in the area Arrange we select the command Selection Pane as shown in the image below. Whatever way we use the task pane named Selection And Visibility appears at the right of our screen. 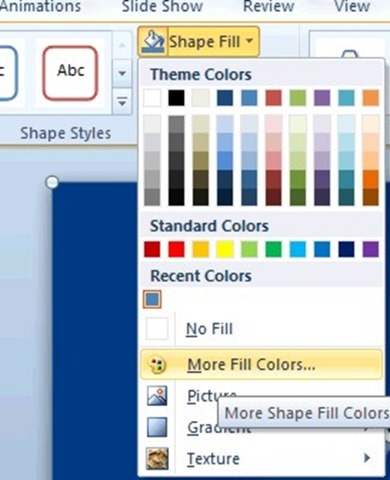 In the area of the Selection And Visibility task pane which is named Shapes On This Slide all the components that are in the current slide appear as shown below. 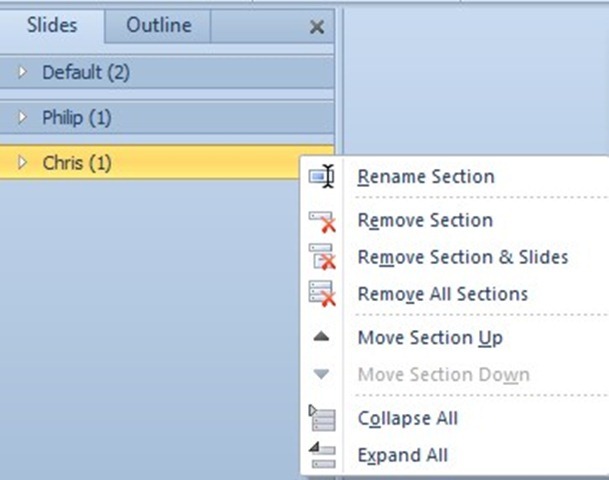 By selecting a name of one element from the task pane, the corresponding element gets selected in the slide. 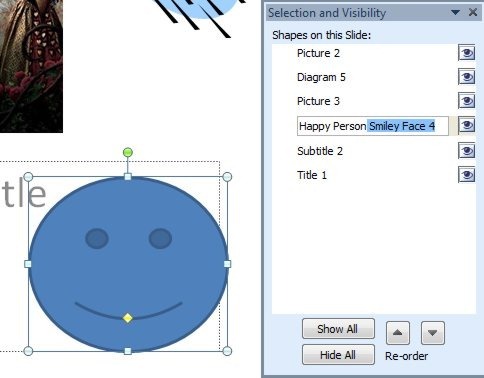 In the image below I have selected Smiley Face 4 from the task pane and right away the corresponding element has got selected in the slide as we can see. 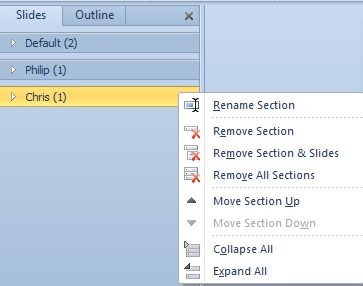 To rename and element from the task pane, we just select the name of it and then by double clicking on it with our mouse in the text box we are able to edit it as shown below. 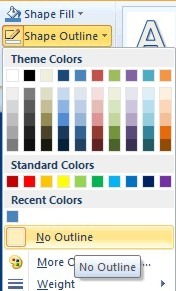 If we want to hide an element from our slide and not to delete it, at the right of the name of the element in the task pane, we can select once on the icon of the eye that appears. 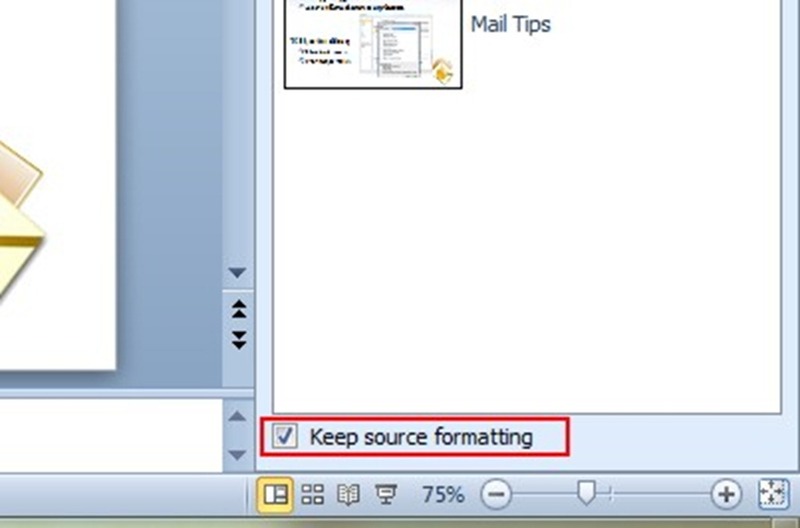 Straight away the element is hidden from the slide, and the eye at the right of the element in the task pane does not appear. With the same procedure we activate the appearance of the element. 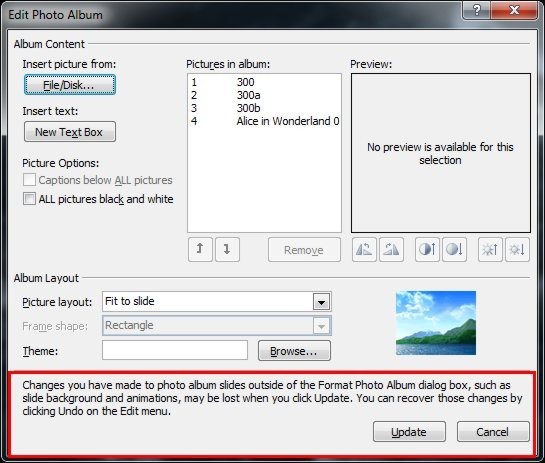 Show All: By selecting this command all the elements that were hidden in our slide appear again at their position. 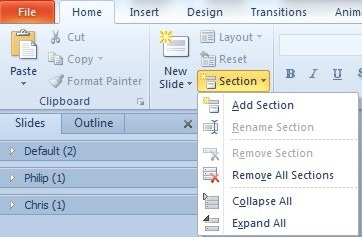 Hide All: By selecting this command we hide all the elements in our slide. Re-order Buttons: By pressing the up or down arrow, when we have an element selected in our slide, we adjust the order of appearance of the element in order with another element. The order of appearance of an element makes sense when one element covers another element, and in this situation we decide which element will be in front and which behind. 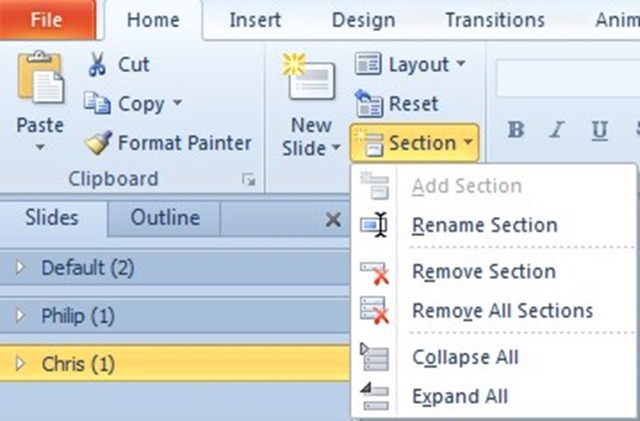 The re-order buttons are useful in PowerPoint, when we want to rearrange the order of appearance of elements in a presentation. 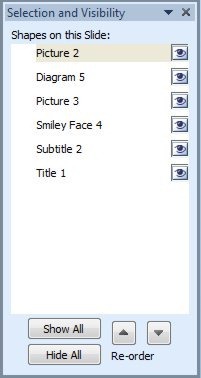 In the image below I have also activated the Animation Pane next to the Selection And Visibility Pane, where we can see that the same names that we had given in the Selection And Visibility Pane, stand also in the Animation Pane. The Selection and Visibility task pane in Word appears on the Home tab and from the area of the window named Editing, we select the command Select and from the drop down menu we select the command Selection Pane. 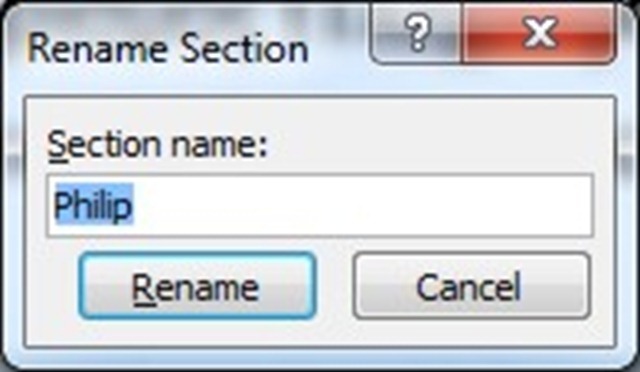 The Selection And Visibility task pane in Excel appears on the Page Layout tab and from the area of the ribbon named Arrange we select the command Selection Pane. First of all we must open the PowerPoint Presentation that we want to convert to Word. 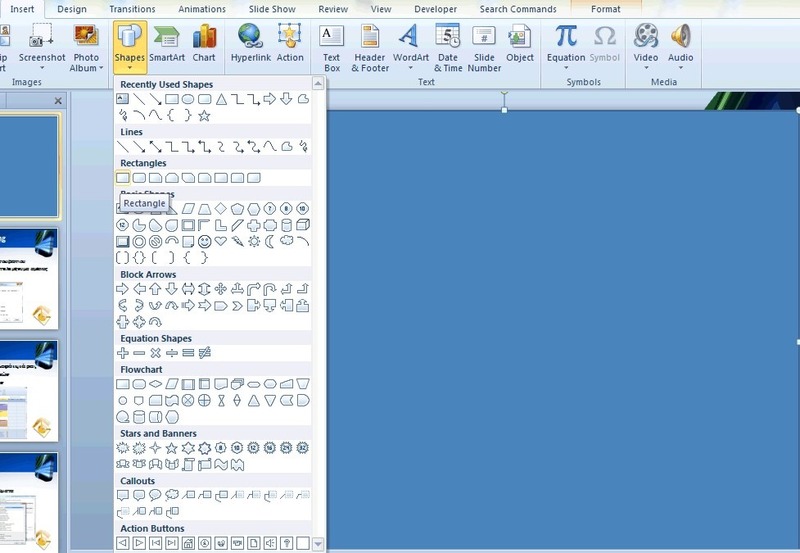 For the PowerPoint 2007 users we must select the Office Button which is located at the top left corner of our window, and from the drop down menu that appears we select the category Publish and then from the right we select the command Create Handouts in Microsoft Office Word. 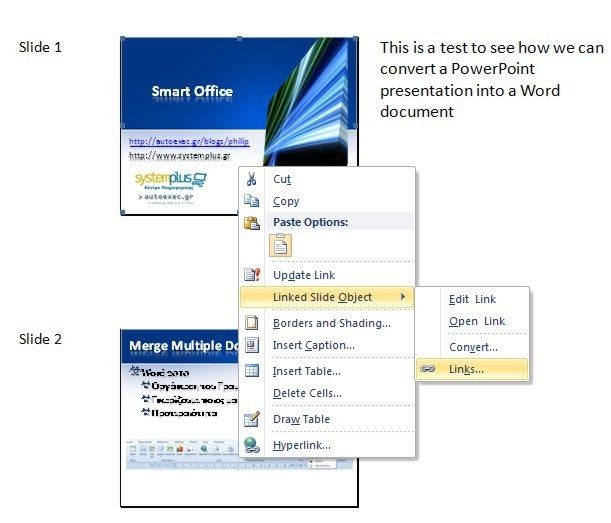 For the PowerPoint 2010 users we must select the tab File in order to go to backstage view and from the drop down menu we select the category Save & Send and then from the right we select the command Create Handouts as shown in the image below. 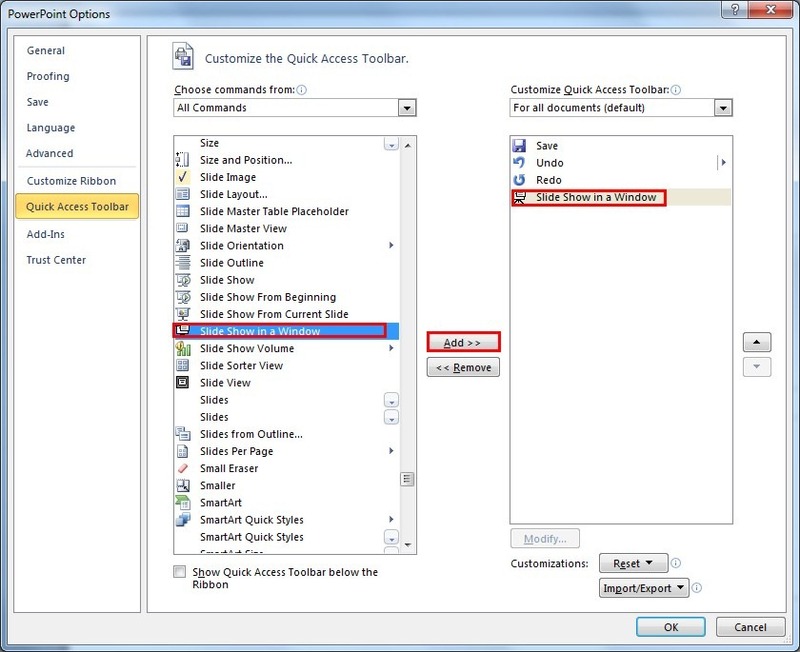 One way or the other the Send To Microsoft Word dialog box appears where we can select the page layout in Microsoft Word. We can select from the following options. 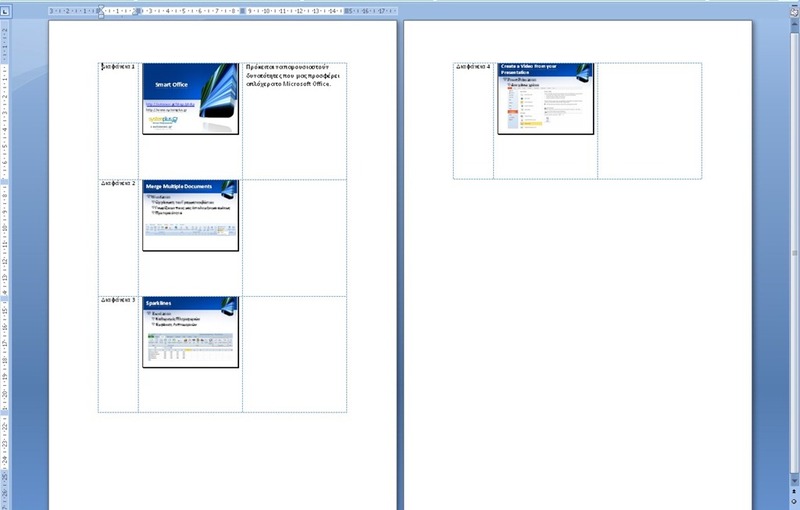 Depending on what layout we chose, the slides will appear in Microsoft Word as shown in the image below, where I had chosen the layout Notes Next To Slides. 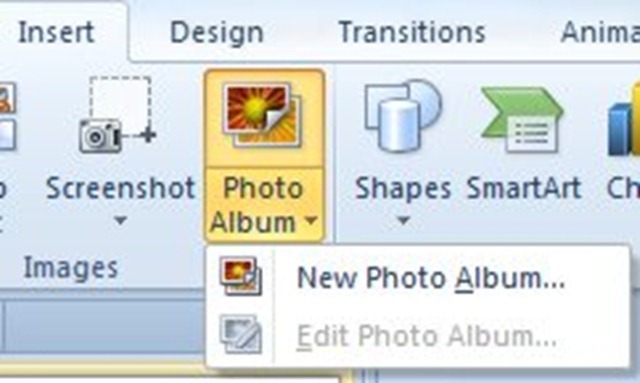 Whatever changes we do though in our slides in PowerPoint will not be updated in Microsoft Word. 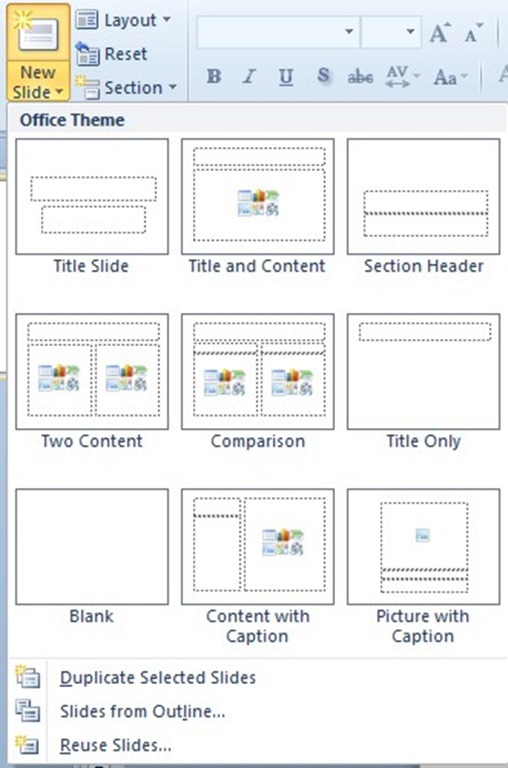 Depending on what layout we chose, the slides will appear in Microsoft Word as shown in the image below. 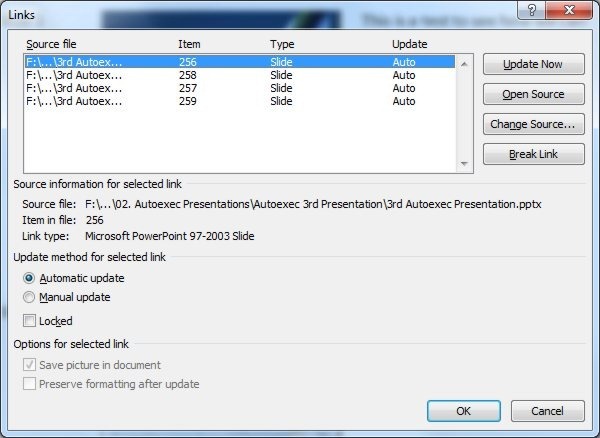 By pasting the slides with a link we can update the slides in the Word document by right clicking on a thumbnail of a slide and from the shortcut menu that appears we select the command Update Link as shown in the image below. 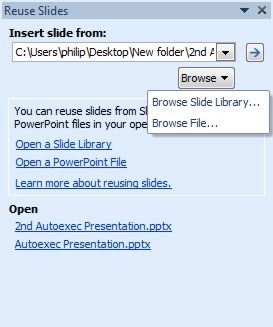 Edit Link: PowerPoint opens in order to edit the slides. Convert: We can convert the link into an object. In the image below I have selected the command Links from the shortcut menu where the dialog box Links has appeared. 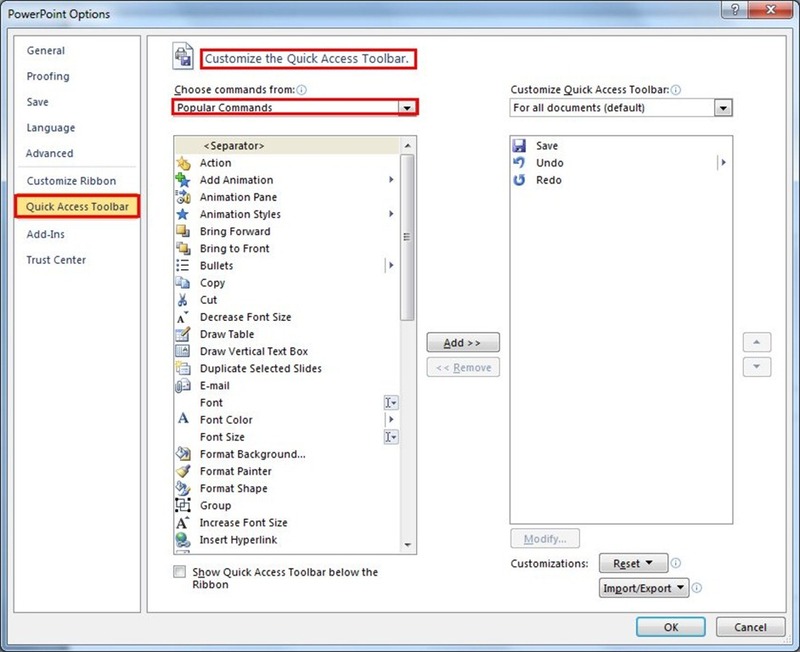 In this dialog box we can do all the adjustments that we want by selecting the appropriate commands. 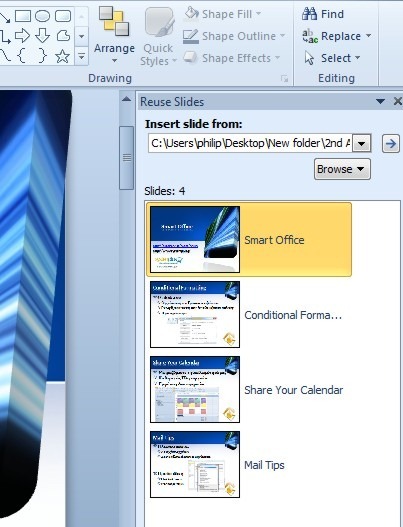 If we double click on a thumbnail of a slide, the PowerPoint application will start automatically with our current presentation ready for editing. 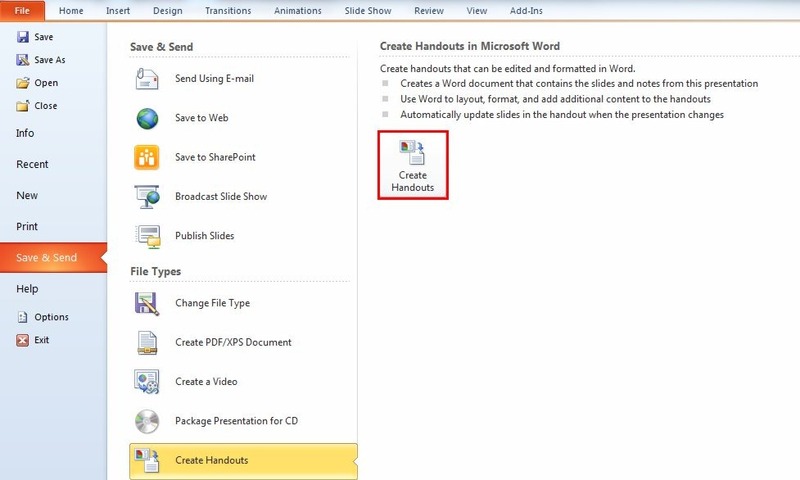 You can also check out the video below, describing the steps on how to Create Handouts From PowerPoint Into Word. We are about to create a presentation and we end up wondering on what our presentation will look like. We then realize that the slides that we want to create might also be available in another presentation that we or someone else has created. What do we do then? We borrow the slides from another presentation of course. Further down I will describe the steps on how to borrow slides from another presentation. I will not use the copy and paste command, but a very useful command which is named Reuse Slides. Reusing existing slides is a lot of help: First of all we don’t need to recreate things that we have already created and secondly we save a lot of time. 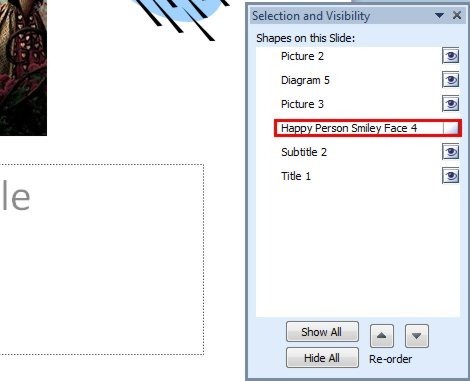 PowerPoint offers us a command that locates specific slides and allows us to insert them into our presentation. 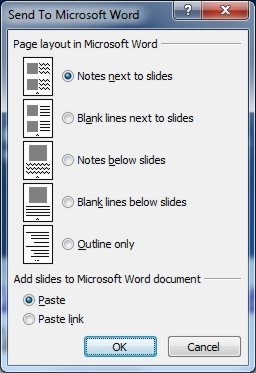 This function exists in previous versions of PowerPoint, with the difference that there are some different functions in PowerPoint 2010. 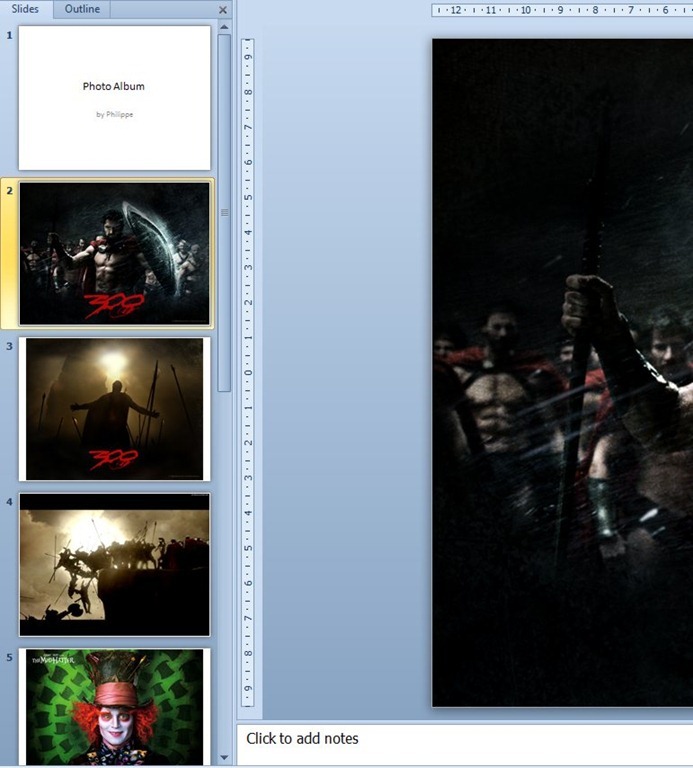 First: We open the presentation that we want to add slides in (not the one that we want to borrow slides from). Then we select the Home Tab and from the area of the ribbon named Slides we select the arrow at the right of the command New Slide where the drop down menu appears. Once the drop down menu appears we notice the variety of slides with their layouts and at the bottom of the window we find the command Reuse Slides as shown at the image below. Once we select the Reuse Slides command the task pane window appears at the right of our screen regarding the Reuse Slides command. 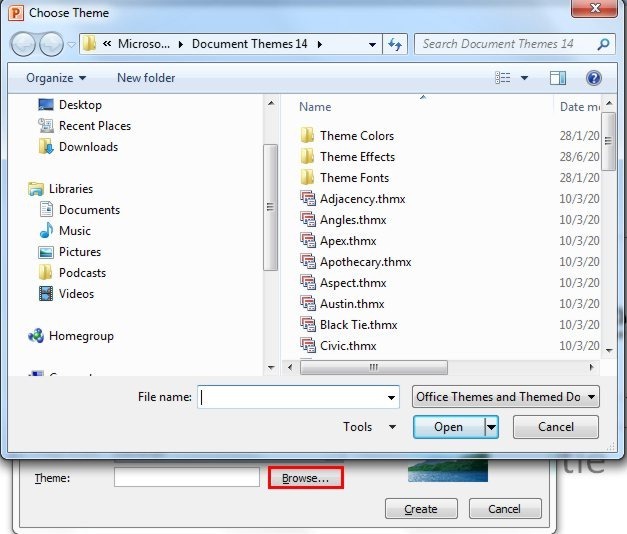 From the task pane Reuse Slides we can select the Browse button and then to select the command Browse Slide Library or Browse File in order to locate the slides. 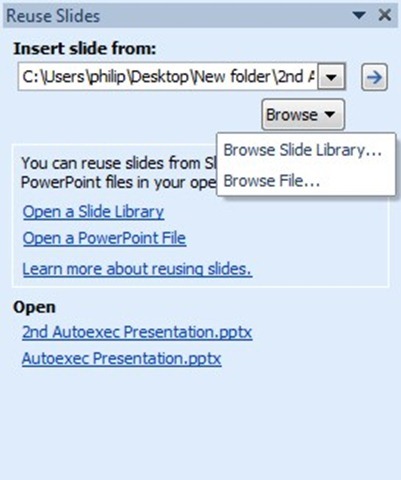 Alternatively we can also select the links named Open A Slide Library or Open a PowerPoint File. 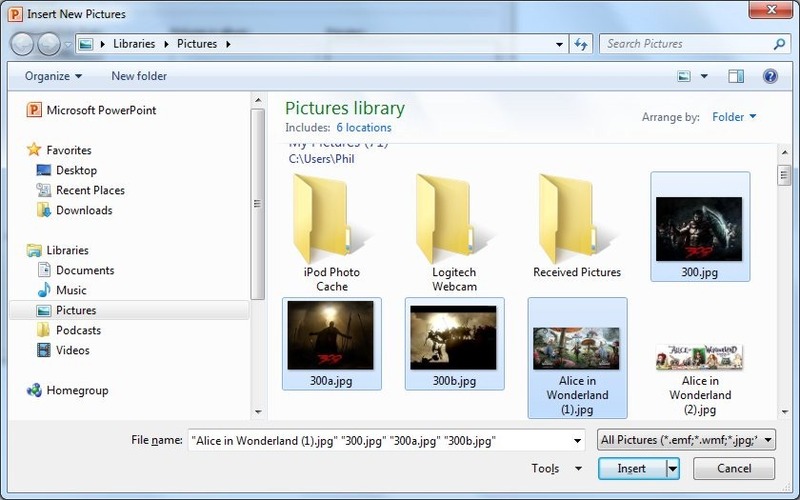 The Browse Slide Library lets us access slides from a Microsoft Office SharePoint Library. This option will only work if a Slide Library is set up for you. 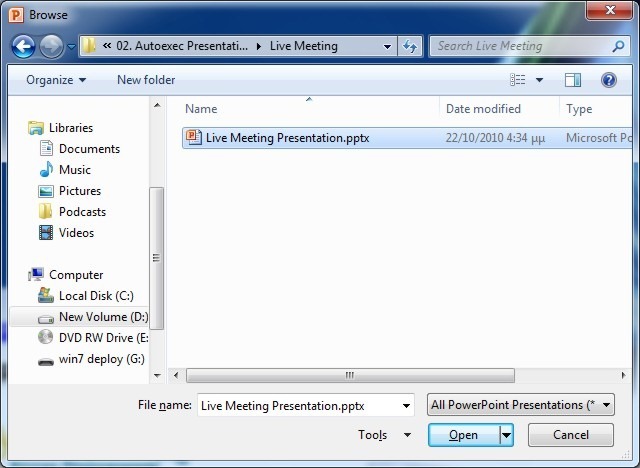 Browse File brings up a dialog that lets you locate the presentation on your computer. 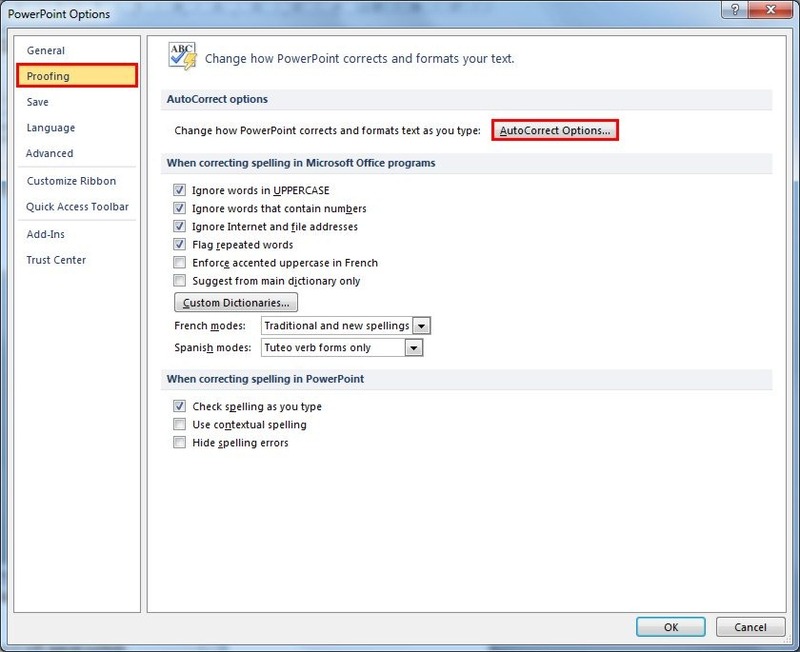 In this post I will select the command Open a PowerPoint File as shown in the image below. I have located the file and I am ready to press the Open button. The slides from the presentation appears straight away in the area Reuse Slides pane as well with the titles of each slide as shown in the image below. Once we move our mouse over the slides, the slide doubles its size, making it more visible in order to see the content of it. 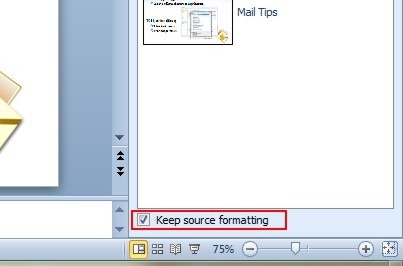 In order to retain the slide formatting of the original slide, we must check the box beside the option Keep Source Formatting which is located at the bottom of the Reuse Slides task pane as shown at the image below. 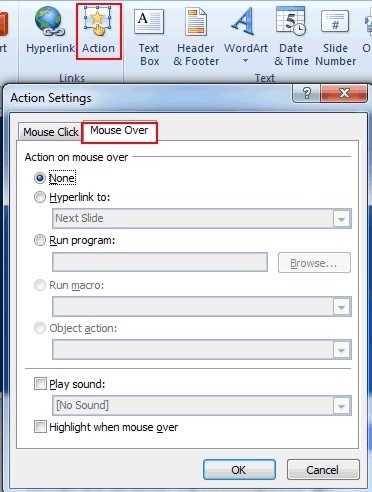 In order to insert a slide in our presentation we just select it with our mouse, and straight away it is inserted in our presentation. 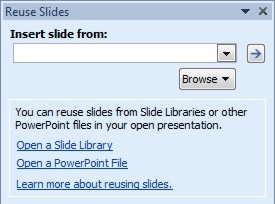 Copied slides will always be inserted after the selected slide in the active presentation. 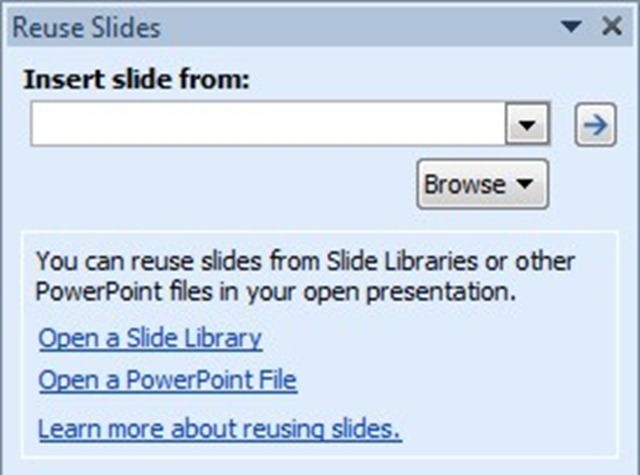 If we right click on a slide from the Reuse Slides task pane we will see the following options. 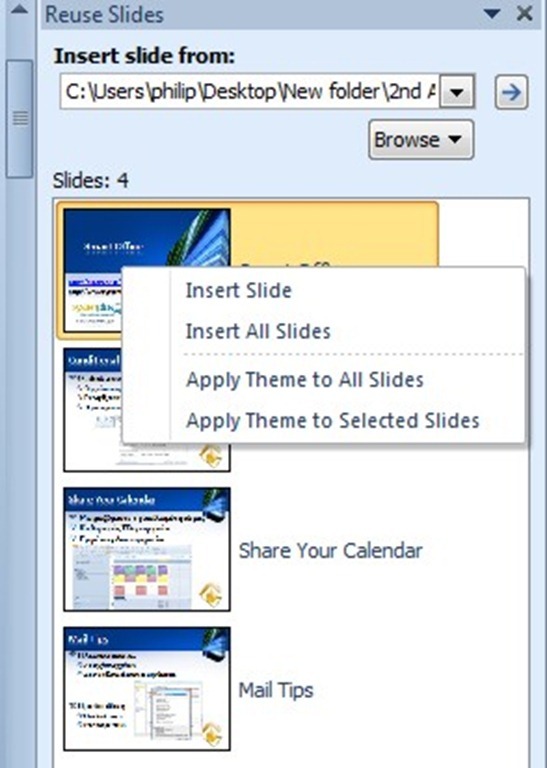 Insert Slide: Inserts the slide into the active presentation and the slide will use the Theme of the active presentation. Insert All Slides: Inserts all the slides into the active presentation and all the the slides will use the Theme of the active presentation. 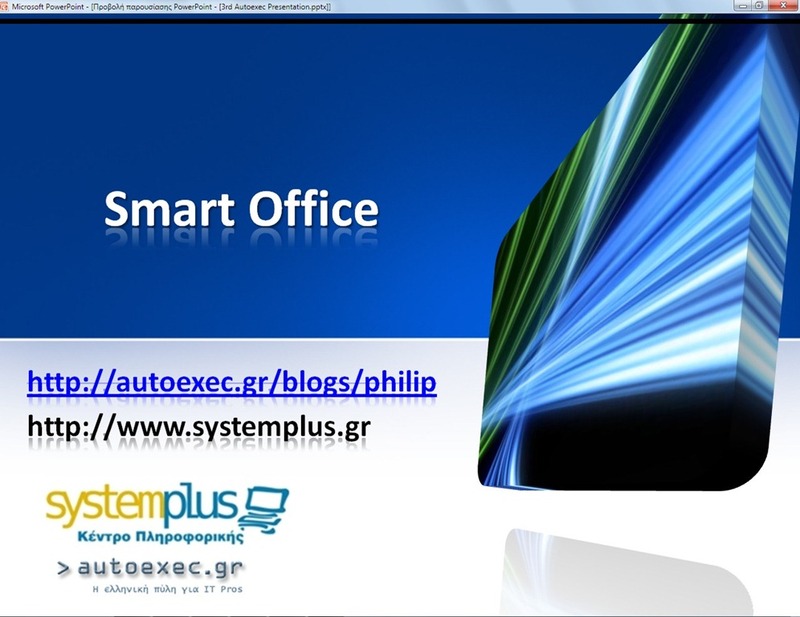 Apply Theme to All Slides: It will apply the Theme of the selected slide to all the slides in the active presentation. No slides are inserted. Apply Theme to Selected Slides: It will apply the Theme of the selected slide to selected slides in the active presentation. No slides are inserted. Once we have finished inserting our slides into our presentation, we press the X icon on the right of the Reuse Slides task pane to close it.